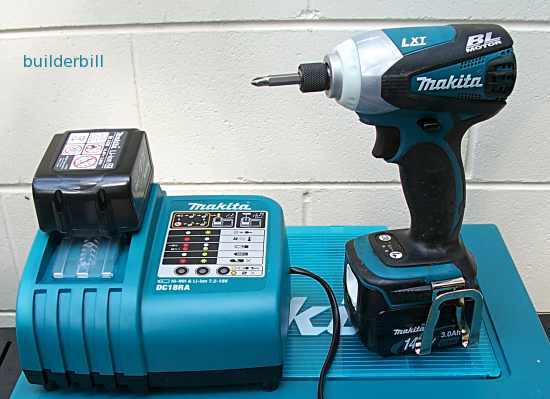 I would have to say that the world of power tools was slow coming to battery operated but when the battery technology finally came of age, everyone from tradies to the DIY are seeing the advantages of them. The advantages are many and apart from cost the downsides are few. For example the impact driver above came with a charger and two batteries. The battery can be fully charged in about two hours, and apart from abusing the tool and using it for something that it is not designed for it always has the newly charged battery ready when the old on runs out of juice. For example:- This quite small tool will drive 75mm x 14gauge type 17 hex head screws into f17 hardwood for an hour or so, but not all day, a full on corded screw gun is the tool for that job. What you see above are the type of batteries that seem to be the state of the art as things stand in 2011. They are known as LI-ION or Lithium Iron. One of the things that I like about them is that as I am retired now and I only use my tools infrequently these Li-Ions keep their charge for long periods of no use, like six months or so. Imagine fixing plasterboard sheets on a ceiling, in the old days we had to have two hands free, one for the screws and the other for the driver. Now it is a one handed operation with this tool. Note! The battery here in an older type known as Ni-Cad or Nickel Cadmium. Another older battery type is know as Ni-MH for Nickel Metal Hydride. The impact driver at the top of the page is a 14.4 volt model and it replaced an older one of the same voltage while at that time I had some 12 volt screwdrivers also. Above we see an 18 volt DeWalt unit. All other things being equal an 18 volt machine will last longer or provide more work between charges than a 14'4 volt model. Things change and the guy that bought his 18 volt tools is probably looking at the new 24 volt tools appearing on the scene. Note! This particular tool gets used often for cutting and fixing damged copper and PVC water pipes in ofen flooded trenches. Not a situation that you would want to use a 240 volt corded tool. This tool gets regular use from it's plumber owner drilling through 200 series core filled masonry walls. 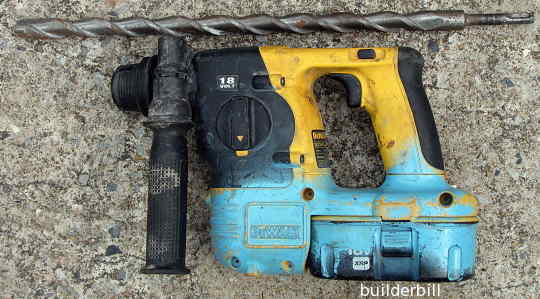 There are many different battery operated tools that have been developed from existing electrical tools, but there are a couple of other cordless power tools that don't use batteries that I can think of that are used in the construction industry. 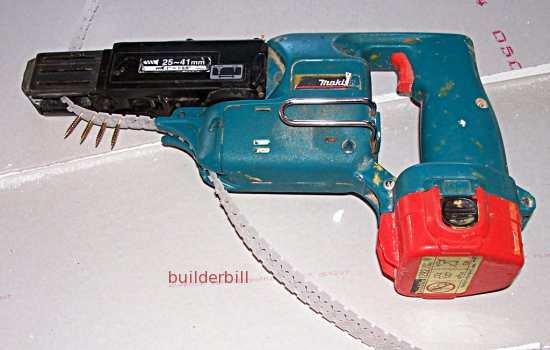 Have a look at the Pasload framing nailer which runs off a compressed fuel cell and the explosive fastener tool.